When you need a sump pump or repair call us. There are four types of sump pumps commonly used – two are electric, one is water-powered while the fourth is available in either option. Pedestal – This type is an upright electric sump pump whose motor is located above the pump as it is not meant to get wet. It has a float-activated switch that turns the pump on when the water reaches a certain level. It is ideal for basements needing frequent water drainage. They are usually the least expensive but tend to be noisier than the submersibles. Submersible – This electric sump pump is installed in ground and specifically designed to function underwater. It has the same float-activated switch as the pedestal. Submersibles are more expensive, but boast a longer life than the pedestal type. Their sealed, oil-cooled motors are protected from moisture and dust, making them quieter. Water powered - This type of sump pump runs off the water pressure from your home plumbing system. It has the same float-activated switch as the electric sump pump types, and handles water at a comparable rate. Since the water-powered pump requires no electricity to operate, it is often installed alongside an electric sump and used as a back up system during a power failure. Water powered sump pumps are energy efficient because they are powered by water, not using electricity. Floor Sucker Pumps – These sump pump types are used mostly in basements, cellars or crawl spaces which do not have an actual sump pit. They are called floor sucker pumps because they remove water to within a 1/8" of the floor (or other surfaces such as a roof or the ground). Available in various flow rates, under manual or automatic operation, while some are electronically controlled, the floor sucker pumps are versatile. They were particularly useful during the east coast storms this fall. Many of us take for granted that we have a sump pump and that it works effectively. Some of us don’t even know what a sump pump looks like, but when a water problem arises in our home, we soon realize their importance. Although sump pumps have a lifespan of 5 to 7 years, they may fail unexpectedly for various reasons. If you have an incorrectly sized pump, or if the pump is not installed properly, you will most likely encounter a problem. Contrary to the common belief that bigger is better, a small sump pump can be just as effective as a big one. In fact, in some cases when a sump pump is too big, the pump is forced to work harder resulting in a shorter product life span. Alternatively, a pump that is too small may not be able to adequately pump out the water - again resulting in a shorter life span. Choosing the correct size for your home will ensure maximum life expectancy for your sump pump. Perhaps the leading mechanical cause of sump pump problems is a switch problem. This occurs when the pump shifts from its position inside the basin, rendering the float ineffective. This is a serious problem because the float is responsible for the smooth operation of the on/off switch. Your sump pump relies on both the switch and the float arm mechanisms to operate effectively. Attentive care should be taken to ensure that they are in good working order. All of the sump pump types are available in either plastic or cast iron. For the cost-conscious homeowner, plastic sump pumps will suit some applications, delivering a dependable product for a reasonable price. For contractor-grade, longer-lasting applications, opt for the cast iron construction. 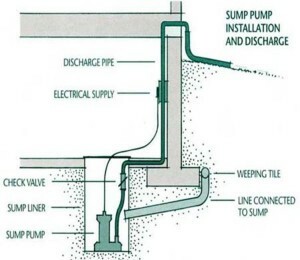 No matter which one you have or have chosen, all sump pump types should have a check valve on the water outlet pipe in order to prevent the water from running back into the sump when the pump shuts off. Water flowing back and forth can cause the pump to turn on and off more than necessary and shorten the life of the pump. Choose the design and material of your sump pump based on the application in your home. Be it an electrical, water-powered or floor sucker model, your home is safer and more secure with a quality sump pump. Apart from the obvious damages to your belongings, flooding can also cause plumbing problems, a damaged foundation or rotted wood; all of which are troubles that bring down the value of your home. A sump pump can save you thousands of dollars in the long run by maintaining the value of your home and by protecting your belongings from water damage. This is what is called "a normal sump cycle". Most problems with the sump pump are float related. If the pump does not start, the float may be hanging on something in the tank. A simple repositioning of the pump should solve the problem. Your sump pump will eventually run into problems as time goes on, but many of these problems can be avoided by knowing your system and taking the proper precautions. Most sump pumps will clog if they catch the wrong kind of debris. The debris can clog the pipe, but the pipe can also clog the pump itself. You may be able to remove the debris yourself, but you will likely need a professional to remove the clog for you. Also, sump pump motors will stop working at some point. If your sump pump is getting older, you may need to have the motor replaced before it stops working. Also, the remote starter for a sump pump could stop working if it is shorted out during a flood; this issue is rare, but still possible. Be sure to have your sump pump serviced regularly to avoid preventable issues. A sump pump keeps your basement or crawl space clear of water at all times. Your sump pump can be triggered manually or remotely, depending on the system that you choose. It is recommend for both safety and reliability that you do not install a sump pump on your own, it is best to have a qualified technician set up the system for you. You can install any number of sump pumps in your home, and it is important to make sure that you know which one is going to work best for you. We can provide you with a list of options and help you to choose what system will work best for your home and budget. A pedestal unit can pump water out through a drain much faster than the drain can flow. A unit that has a battery backup system can be triggered remotely, and you will not have worry about wading into a flooded space to turn it on. Also, you can turn on the unit even if you have lost power in the home.